Previously, we beefed up our Elixir-based Bitcoin-node-in-progress to use the Connection behavior to better manage our connection to our peer node. Now that we can robustly connect to a single peer node, let’s broaden our horizons and connect to multiple peers! Let’s refactor our node to use a dynamic supervisor to manage our collection of connections, and start recursively connecting to nodes in the Bitcoin peer-to-peer network! Each of our connections to a Bitcoin peer node is currently managed through a BitcoinNetwork.Node process. We’ll manage this collection of processes with a new dynamic supervisor called Bitcoin.Node.Supervisor. The code here is largely boilerplate. Our Node.Supervisor initiates itself with a :one_for_one strategy (the only supervision strategy currently available to a dynamic supervisor). It’s also important to note that like all dynamic supervisors, our Node.Supervisor starts without children. We simply moved our BitcoinNetwork.Node child specification out of our old supervisor’s child list, and dropped it into our call to DynamicSupervisor.start_child/2. Now it’s clear that when our application starts up, it creates a new dynamic supervisor, Node.Supervisor, and then connects to the Bitcoin node specified in our application’s configuration. At this point, we’re back up to feature parity with our original one-node solution. All we’ve really managed to do it add a supervisor layer into our supervision tree. Now that we’re equipped with our connect_to_node/2 function and our new dynamic node supervisor, we’re ready rapidly expand our network of known Bitcoin nodes. 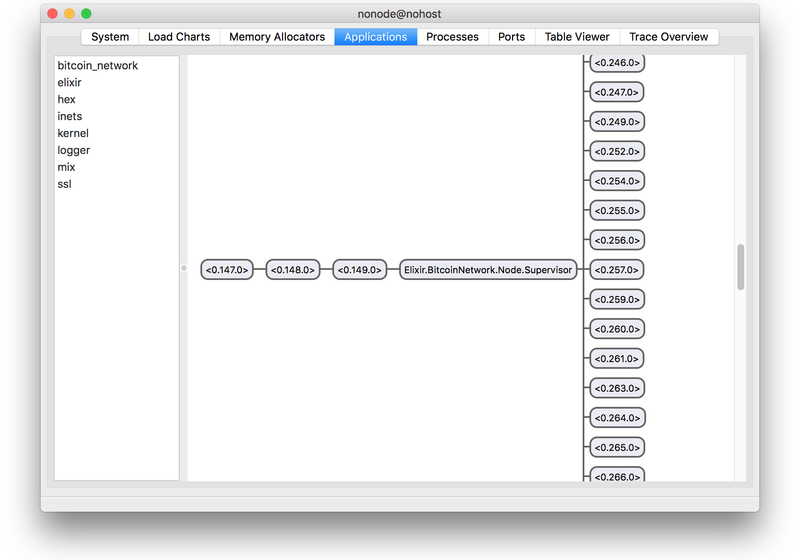 Now our application fires up, connects to our initial Bitcoin peer node, receives that node’s list of peers, and spawns a dynamically supervised process that attempts to connect to each of those peers. If any of those peers successfully connect and return their list of peers, we’ll repeat the process. At this point, our Bitcoin node will happily spreading itself through the Bitcoin peer-to-peer network, introducing itself as a peer to tens thousands of nodes. However, this level of connectivity might be overkill for our node. We need some way of limiting the number of active peer connections to some configurable value. Let’s start with a limit of one hundred twenty five connections, just like the default limit in the Bitcoin core client. And that’s all there is to it! Now, every time we receive a peer and try to connect to it, our connect_to_node/2 function will first check that we haven’t exceeded the max_peers limit defined in our application’s configuration. Our Bitcoin node will now limit its pool of peers to a maximum of one hundred twenty five connections. Elixir’s dynamic supervisor is a breeze to work with and made it possible to easily and quickly scale up our pool of peers from one to tens of thousands of connections in the blink of an eye. While our Bitcoin node is working its way through the Bitcoin peer-to-peer network, it doesn’t actually do anything. 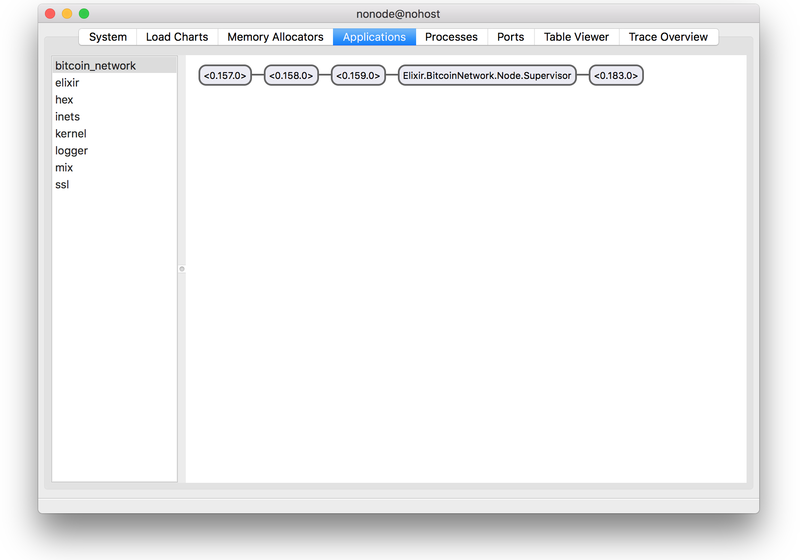 We’ll need to spend some time in the future figuring out how to process incoming blocks and transactions. Maybe at some point we’ll even be able to send our own transactions and mine for new blocks! It sounds like we’ll have to dust off Mastering Bitcoin and finish off the few remaining chapters. This article was published on May 21, 2018 under the BitcoinElixir tags. For more articles, visit the archives. Also check out the work I do, and reach out if you’re interested in working together. Beefing Up our Bitcoin Node with Connection – Let's beef up the resiliency of our Elixir-based Bitcoin node by incorporating some connection retry behavior. Modeling Formulas with Recursive Discriminators – I ran into an interesting problem recently where I needed to model a nested set of either/or sub-schemas. With some creative thinking and a healthy dose of recursion, Mongoose's discriminator feature turned out to be just the tool for the job.